The third time the high-pitched alarm rang “deedle deedle” in the F/A-18F Super Hornet’s cockpit, it was clear that something with the air flowing into their regulators had gone horribly wrong. Physiological episodes — including hypoxia and decompression sickness from loss of cockpit air flow — , which are hard to diagnose after the fact, are a confirmed cause in at least 15 naval aviation deaths in the past two decades — and aviators are worried more pilots may die before officials fix the problems. “There’s only one thing that scares the s— out of guys that fly the airplane, and it’s OBOGS,” the pilot said in an interview. That day in Nevada, the pilot and the NFO pulled out their backup oxygen bottles, landed the plane and met with the squadron’s safety officer to file a report. It turned out, the pilot said, that the jet’s OBOGS had stopped producing oxygen. What’s more, he added, the filtering material inside the system had just been cleaned and it was the jet’s first flight with a fresh oxygen generator. That was back in 2007, when aviators reported annually a dozen or so reports of physiological episodes — the technical term for the effects when a plane stops producing oxygen, pumps a toxin into the cockpit or loses pressurization. The rates were troubling. In 2010, Navy aviation pushed to get pilots and aircrew to report every time they thought they’d had an episode. And NAVAIR engineers focused on how to improve OBOGS and the environmental control system — the pieces of the airplane that keep clean, dry air circulating. Navy officials say it’s progress that more fliers are recognizing and reporting physiological episodes. They say the causes of these distressing incidents are varied across the air systems’ dozens of components, many of which have been modified and are now being more regularly checked. Meanwhile, engineers work to develop sensors that detect air contamination and low oxygen levels. The Navy’s air warfare director summed up the dilemma in a tense exchange during a February hearing. The fixes, pilots say, aren’t coming quickly enough. “It seems like all we do is react to hypoxia incidents and troubleshoot each jet, but we aren’t actually doing anything to prevent it from happening,” said an East-Coast F/A-18 pilot and hypoxia victim, who also asked for anonymity. The Air Force’s F-22 Raptor has suffered from similar problems. After hypoxia concerns arose in 2011, the brass grounded the F-22 fleet for four months. After they resumed flying, two F-22 fliers went on “60 Minutes” to say they wouldn’t fly the aircraft until the problems were fixed. In July 2012, the Air Force said it had fixed the faulty valve on the pilot’s life support vest that was causing the oxygen deprivation. The Air Force also added an automatic backup oxygen system, while the Navy has stuck to its manual procedure. The air flow issues have bedeviled the Navy and Marine Corps’ fleet of F/A-18 Hornets, EA-18G Growlers and T-45C Goshawk trainers, all of which use the OBOGS. In the case of air contamination, there are no warning systems to alert the aviators breathing disorienting and potentially deadly gases. Complicating the assessment of the breadth of the incidents is the general reluctance of pilots to report what seem to be physiological problems, which can remove their flight status. Meanwhile, the reported number of events is skyrocketing. Aviators reported 15 physiological episodes in 2009, concentrated in strike aircraft and the trainer jets that aviators learn on, according to Naval Safety Center data. By 2015, the fleet reported an eight-fold increase to 115 episodes: 31 in the T-45C Goshawk trainer and 41 in Hornet variants, plus 19 in the EA-18G Growler. The Marines also reported a spike that year, including hypoxia and OBOGS failure in the brand new F-35B joint strike fighters and seven more events involving its legacy Hornets, as the F/A-18 A through D variants are known. Officials say that the rise in reports comes from greater awareness, but it’s unclear whether updates are making a dent. The first two months of 2016 saw 26 episodes, putting the numbers on track to pass 100 again. Physiological episodes can be caused by everything from equipment failure to human and maintenance errors, but the Navy has shored up efforts to get depressurization and OBOGS failure under control by overhauling both ECS and OBOGS, the systems that take injected air and circulate it through the airplane and into the pilots’ breathing regulators. ECS uses air from the engine intake and cleans out any moisture that would harm pilots or the instruments in the jet, before passing some into the cockpit for pressurization and the rest into OBOGS to be purified for breathing air. NAVAIR’s efforts have flown mostly under the radar, even in the fleet, where some junior officers are out flying and suffering from oxygen loss but completely unaware that big Navy is working on improvements. In the meantime, aircrew are relying on the backup breathing system, which is a bottle of liquid oxygen stored under their seats. 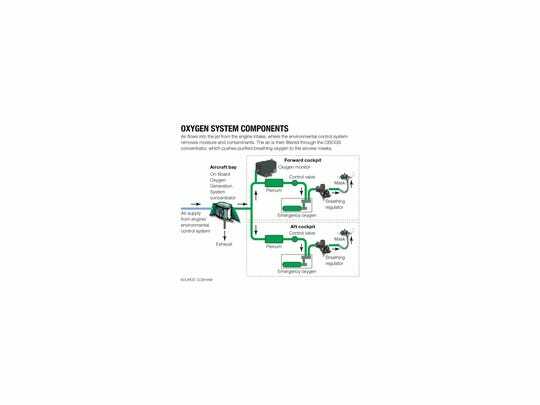 If something goes wrong, they pull the green ring on the system, which switches their regulators from OBOGS to that temporary supply of LOX. The issue burst into public view in February, when a lawmaker pressed Manazir for answers on how the Navy was addressing the alarming rise in hypoxia. “It is, I think, an issue that despite all your investments and policies and training and everything else … the numbers still don’t go down,” said Rep. Niki Tsongas, D-Mass., at the House Armed Services Committee hearing. Jets need a better backup oxygen system, as the current bottle buys a pilot 20 minutes if they’re really calm; that could be three minutes if they’re freaking out. Tsongas also suggested an automatic backup oxygensystem similar to that used by the Air Force. Officials say that’s tricky because the bottle fits under the seat, and there’s only so much room to make it any bigger. And they assured her that the problems are under control. 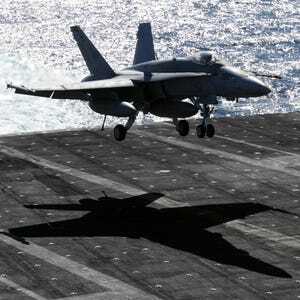 If the Navy were concerned about the safety of the jets, he added, they would ground the fleet. But inside ready rooms, his comments landed like a ton of bricks. The pilot also pointed out that Manazir’s timeline suggests his first 16 years flying were with liquid oxygen pumping into his mask, a system which OBOGS replaced. The Naval Safety Center is the service’s central repository for reportedphysiological episodes, which range fromloss of oxygen or air contamination to black-outs from G-Forces, and in one case, an MH-60 Seahawk aircrewman who severed his finger during a hoist. For this story, Navy Times zeroed in on the more than 750 Navy and Marine Corps reports of hypoxia, decompression sickness, loss of pressure and warnings or failures of OBOGS and ECS since 2009. In interviews at their Naval Air Systems Command headquarters, engineers and program officers said they’re hard-pressed to find patterns. There are also some patterns for which types of failures happen at which times, but it’s not exact, said OBOGS lead engineer Dennis Gordge. “Bottom line is, I had two very scary wave-offs and then I trapped on the third pass. My emergency O2 ran out while I was still airborne and I don’t even remember seeing a ball on the lens,” the pilot said, speaking of the heads-up display guide that shows pilots their landing trajectory. Aircraft have built-in sensors to warn when a system is failing, like if the OBOGS itself isn’t working. But if it’s not filtering out contaminants properly, or if it’s not pumping out enough air, there’s no warning for that. “The problem with these kinds of episodes is, the diagnostic machine — that is, your brain — is the very thing that’s being impacted,” Kindley said. NAVAIR has been working on a sensor for about eight years, Gordge said. When asked why OBOGS wasn’t developed with it, he couldn’t be sure. “And the fleet representative said, ‘No, I’ll know the system’s broken when I can’t breathe,’ ” he said. Developing the sensor has taken time and money, and NAVAIR doesn’t want to replace what it’s using unless they know it’s a better option, he added. It’s scheduled to go online in 2017. The sieve is a sand-like material that traps nitrogen and pumps oxygen and argon, a harmless gas, into the aircrew regulators. It’s very efficient, Gordge said, and can be cleaned and reused a few times before it needs to be replaced. However, the sieve the Navy bought for OBOGS back in the 1990s isn’t manufactured anymore, so in recent years they scouted out a mix of two newer materials, Gordge said, and those have been changed out in over 300 aircraft so far, with priority going to deploying squadrons. The hitch, however, is that those long flights put more stress on the components, and OBOGS is only designed to filter clean, dry air. If there’s something else in the concentrator, there will be problems. Many of those components were designed as “fly-to-failure,” he said, but now the system goes into depot maintenance based on 400- or 800-hour flight limits and gets an inspection and replacement whether it’s broken or not. Still, ECS’s main function is to take water out of the humid ocean air in the carrier environment, not to take out contaminants. If a toxin is water soluble and makes its way in, it’ll stay there when ECS removes the moisture. Or in some cases, normal operations get in the way. The Navy does aerial refueling, Gordge said, and the boom goes right next to the engine’s air intake. “Nowhere in the OBOGS design specification did it allow you to pour raw fuel into the OBOGS, but it happens,” he said. Without a sensor to tell the aircrew what’s going wrong, they must diagnose themselves, and then NAVAIR engineers must diagnose their equipment. Pilots and NFOs are required to get hypoxia training every year, with a spin in an oxygen deprivation simulator every other year. This way they become experts at spotting the signs in themselves and others. That’s key because the guy flying the plane might not realize what’s happening. The West Coast pilot told the story of a pilot doing an acceptance flight for a new jet, who got home safely but felt like something wasn’t right, so he looked at his cockpit video recording. In some cases, the pilot will feel sick but the NFO won’t, or one will feel effects after landing and the other won’t. The other complication is that the issues can be fleeting. One of the pilots had a suggestion for those feeling hypoxia symptoms: First, follow procedure and pull the green ring to stop the airflow and activate the backup oxygen. NAVAIR is planning to visit major air stations to talk about what they’re doing to improve the systems. But some fliers are fed up.